(Sept. 27, 2018) – UTSA Provost and Vice President for Academic Affairs Kimberly Andrews Espy and Interim Vice Provost for Graduate Studies and Dean of the Graduate School Can Saygin recently released the results of an external review of the Graduate School that was conducted in August. The report outlines recommendations related to the structure of graduate education at UTSA, recruitment and admissions, graduate student funding, and the administrative structure of the Graduate School. The Graduate School should redefine its mission to explicitly focus on providing support services to the academic units that deliver graduate education. The roles of the Graduate Council, Associate Deans for Graduate Studies, and Graduate Advisers of Record should be streamlined and more clearly delineated to reduce overlap of roles and responsibilities, to enable transparency and accountability, and to eliminate confusion. The Graduate School can positively impact strategic enrollment by focusing on early stage recruitment and efficient admission processes so that the academic colleges can focus on the quality of graduate programs and the student’s experiences. Internal processes for approving new graduate programs should be streamlined to minimize time to approval and be more responsive to market demand while faculty governance is maintained. Recognizing intense competition for graduation students, a holistic redesign of the appointment and funding for graduate students should be aligned with institutional research excellence and student success goals. “We already have taken a critical initial step, which was supported by this external review, with the recent restructuring of the Graduate School, specifically in aligning the related functions of recruitment and admissions under one area as strategic enrollment,” said Espy. “The report also noted that the recent adaption of tools including the degree audit system Degree Works and the customer relationship management system Salesforce will improve processes and communication, both for the benefit of our current and prospective students, as well as the faculty and staff who support them. 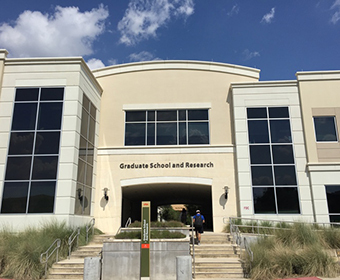 Learn more about the UTSA Graduate School.